Celebrate the spirit of gymnastics and the beauty of the balance beam with this CHARM IT! Gymnastics Girl charm. Perfect for gymnasts of all ages, this colorful charm features a pink-trimmed blue background star with a pink gymnast perfectly poised over the golden balance beam. Flip the charm over to reveal that you'll always be a gymnastics girl at heart with "Gymnastics Girl" and three hearts printed in pink. As with all CHARM IT! 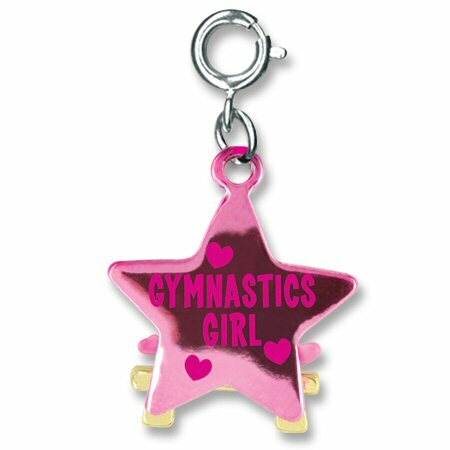 charms, just a simple snap of a clasp lets girls personalize their charm bracelets with this fabulous Gymnastics Girl charm by CHARM IT! Celebrate different styles of dance and show off your moves with a CHARM IT! World of Dance charm. We've got spirit, yes we do! We've got spirit and you can too with this fun CHARM IT! Cheer charm. This cool CHARM IT! Tennis charm includes a yellow enamel ball on a chain the perfect length to serve up some fun.